Stuff Points: Earn 526 points when you buy this stuff. A realistic tree trunk seems to cling to a pile of rocks with it's network of twisted roots. Three large leaves are supported by the trunk, and positioned at different heights and angles to create a path for the water to flow. Once operational, an endless stream will cascade down each leaf on it's journey to the lighted pool at the bottom. It will cycle over and over again, but the water begins its travels by pumping up to the top of the trunk to fill the highest leaf. A small waterfall will form once the pool at the center of the leaf fills to capacity, and it will pour endlessly into the one below it in order to collect water there. A slightly bigger waterfall will form at the side to take the stream down to the last tier, and once that one fills, it will cascade down to fill the lighted pool. 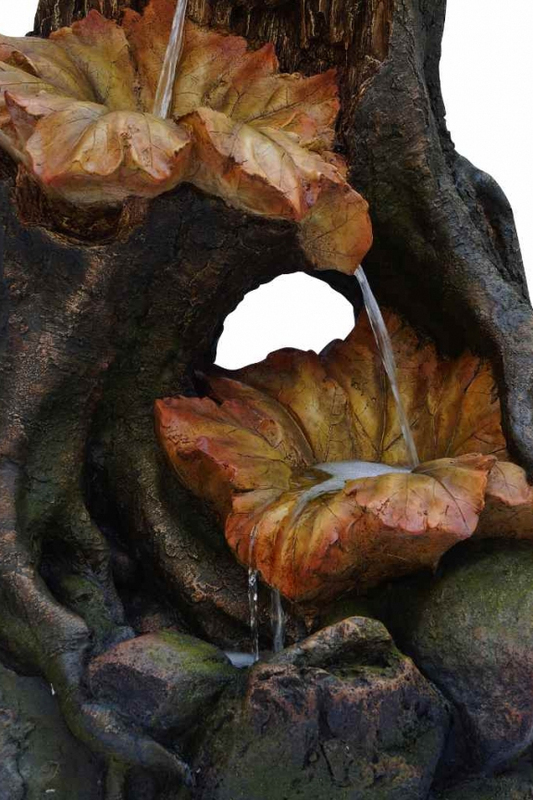 The detail work makes this model look like the real thing, but instead of real wood, stones and foliage, it's actually made from a durable poly-resin that provides a realistic look without the same cost, mess or weight. It will blend flawlessly with any backyard landscaping to make your garden come to life, or enhance the ambiance near your patio. It comes with everything you need, and setting it up is easy for anyone. It's higher in quality when compared to other options, and it comes complete with a one year warranty from the manufacturer. Simple Set-Up. This outdoor fountain ships complete with everything necessary to set it up, and it requires little to no assembly. Just fill it with water, and plug it into any regular outlet to complete the installation process. Poly-Resin Construction. The durable material looks like the real stones, wood and foliage, but it's much lighter, and far less expensive. Multiple Tiers.The three leaves are supported at different heights so water can cascade from one to the next as it travels to the pool at the bottom. Integrated Lights. The lower pool is illuminated by underwater LED lights. This enhancement sets the mood at night, but it also improves the look of the running water all day long. This model is 35 inches tall, and 22 inches wide on it's longest side. This fountain is pretty big, so most people will use it on the ground outside. It is self contained, so indoor use is also possible, but due to the height, table top placement will be rare. A realistic log supports three large leaves to create a path for water to flow. Blend with existing landscaping for the perfect backyard water feature. Order Yours Today! are there LEDs in the two bottom leafs and the pool at the bottom? 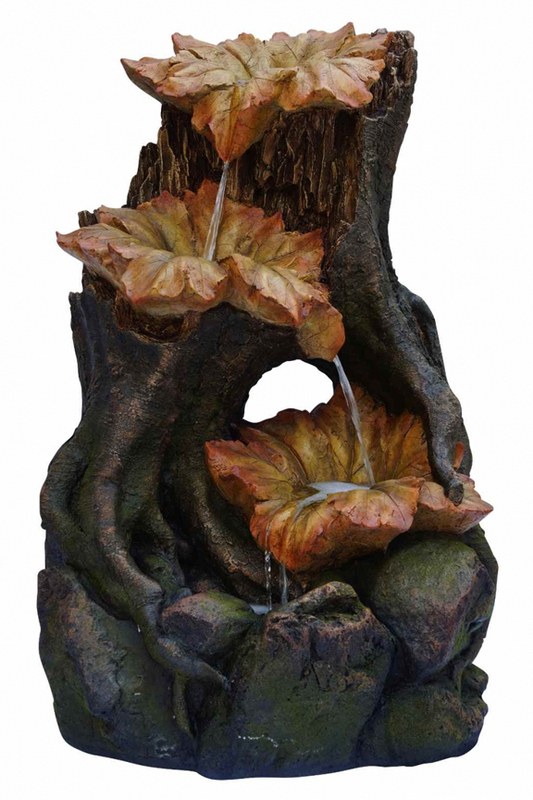 A Large Outdoor Water Feature With Amazing Detail And LED lights.